Climate change is expected to be more rapid and severe in polar regions compared to other places on Earth. Several positive feedback mechanisms exist, particularly for the Arctic, that can amplify the impacts of anthropogenic global warming. Decreases in the extent of snow and ice cover, for example, will lower surface reflectivity (albedo). As a result, incoming solar radiation will be absorbed by the darker surfaces, thereby enhancing warming of ocean and land. Similarly, a northward shift of biomes will lead to growth of more and taller vegetation in previously sparsely vegetated areas, which also lowers albedo. Although there is some variability among models, most projections indicate that increased CO2 concentrations will lead to a polar warming that is greater than the global average, with more warming over land than sea and the maximum warming occurring in winter (Kattenberg et al., 1996). Already, observed temperature trends in the polar regions indicate that significantly greater warming has occurred there over the past few decades compared to the global average. Other expected changes are increased precipitation and soil moisture in winter, a reduction in the strength of North Atlantic currents, and a reduction in the diurnal temperature range. There is substantial evidence that the Arctic climate is warming (e.g., Dickson, 1999; Weller and Anderson, 1998). Average annual temperature in the Arctic has increased by about 1° C over the last century -- a rate that is approximately double that of global average temperatures (IPCC, 1998). Winter temperature trends show about a 2° C warming trend over nearly 100 years (Everett and Fitzharris, 1998). In both cases, the century-long warming is characterized by long-term fluctuations, with rapid warming in the last three decades. This recent warming has been accompanied by decreases in the extent and thickness of sea ice, increases in borehole temperatures in permafrost and permafrost thawing, and later freeze-up and earlier break-up dates for river and lake ice. Permafrost warming has been reported in Russia, China, Alaska, and western Canada (Osterkamp et al., 1998). Where the permafrost has a high ice content, extensive thaw has resulted in ground settlement of as much as 5 to 10 meters -- damaging houses, roads, airports, and pipelines. There is growing evidence that the Arctic Ocean sea-ice cover is in a period of rapid transition (see Kerr, 1999). Satellite monitoring since the 1970s has revealed a decline in the total areal extent of Arctic sea ice at a rate of about 3% per decade (Johannessen et al., 1995). A new analysis shows that the area of multiyear ice is declining more rapidly, by 7% per decade since 1978 (Johannessen et al., 1999). Furthermore, during the 1990s there were four summers in which the extent of sea ice was the smallest ever observed (USGCRP, 1999). Sea-ice thickness also appears to be declining. A study of data collected on submarine cruises shows that mean ice draft (thickness from the ocean surface to the bottom of the ice pack) for 29 stations decreased by 1.3 meters compared to 20 to 40 years ago, representing a 40% reduction in ice volume (Rothrock et al., 1999). This thinning is considered remarkable in that it occurs across the entire deep Arctic Ocean basin. Although many scientists attribute sea-ice changes to a natural fluctuation in atmospheric circulation -- known as the Arctic Oscillation -- recent modeling indicates that the observed ice loss trends are much larger than would be expected from natural climate variations alone (Vinnikov et al., 1999). Evidence also exists that the Antarctic Peninsula, the northernmost section of Antarctica, is warming. Researchers from the British Antarctic Survey report a warming trend of 2.5° C since the 1940s. The retreat of ice shelves on both the eastern and western sides of the Peninsula since 1995 has been attributed to the regional warming, which has caused the annual melt season to increase by 12 days over the last 20 years (NSIDC, 1999). The shelves are apparently weakened by ponded meltwater on the surface and thus become more susceptible to fracturing. Rather than calving relatively large bergs at their front in a few major calving events, the shelves are shattering into thousands of smaller bergs that are then dispersed by storms, wind, and waves. The disintegration of the Larsen B ice shelf has been unusual in its speed and magnitude. Over 3,000 sq. kilometers were lost from the Larsen B ice shelves in just 35 days in February-March 2002, compared to 7,000 sq. kilometers for all ice shelves in the region over the last 50 years. Any climate change that shifts the freeze-thaw line either in time or space will cause important impacts on physical, biological, and human systems (Everett and Fitzharris, 1998). The indigenous peoples of the Arctic depend heavily on the natural resources and healthy functioning of ecosystems. The Yupik and other groups have already experienced the impacts of a changing, warming Arctic climate (USGCRP, 1999). They report delays, for example, in the formation of sea ice as well as early melt and deterioration that have delayed or decreased the length of the hunting season. They also have observed the prevalence of more rain, fog, and cloudy skies during the "drying season" (spring and summer), when traditional foods are air-dried for storage for the coming months. Biological systems are impacted in similar ways. Lack of ice or poor ice conditions often mean that newborn seal and walrus pups do not have sufficient time to wean properly and will not survive. Sea ice also serves as a seasonal migration route for polar bear and Arctic island caribou. Heavier snowfall and freezing rain events will increase the energy expenditure of caribou and reindeer when migrating and searching for food, and could lead to significant population declines over time (Gunn and Skoglund, 1997). Dickson, B., 1999. All change in the Arctic. Nature 397, p. 389-391. Everett, J.T. and B.B. Fitzharris, 1998. The Arctic and Antarctic. In The Regional Impacts of Climate Change: An Assessment of Vulnerability, 85-103, (Eds RT Watson, MC Zinyowera, RH Moss), Cambridge University Press, Cambridge, UK. Gunn, A.and T. Skogland, 1997. Responses of caribou and reindeer to global warming. Ecological Studies 124, 189-200. IPCC, 1998. The Regional Impacts of Climate Change: An Assessment of Vulnerability, (Eds RT Watson, MC Zinyowera, RH Moss), Cambridge University Press, Cambridge, UK. Johannessen, O.M., E.V. Shalina, and M.W. Miles, 1999. Satellite evidence for an Arctic sea ice cover in transformation. Science 286, 1937-1939. Johannessen, O.M., M.W. Miles, E. Bjorgo, 1995. The Arctic's shrinking sea-ice. Nature 376, 126-127. Kattenberg, A., F. Giorgi, H. Grassl, G. A. Meehl, J. F. B. Mitchell, R. J. Stouffer, T. Tokioka, A. J. Weaver, and T. M.L. Wigley, 1996. Climate models - projections of future climate. In Climate Change 1995: The Science of Climate Change, 285-357, (Eds J. T. Houghton, L. G. M. Filho, B. A. Callander, N. Harris, A. Kattenberg, and K. Maskell) Cambridge University Press, Cambridge, UK. Kerr, R.A., 1999. Will the Arctic Ocean lose all its ice? Science 286, 1828. Osterkamp T.E., D.C. Esch, and V.E. Romanovsky, 1998. Permafrost. In Implications of Global Change in Alaska and the Bering Sea Region. Proceedings of a Workshop, June 1997. (Eds. G. Weller and P. Anderson) Center for Global Change and Arctic System Science, University of Alaska Fairbanks, Fairbanks, Alaska. 157 p.
Rothrock, D.A., Y. Yu, and G.A. Mayhut, 1999. Thinning of the Arctic sea-ice cover. Geophysical Research Letters 26 (23), 3469-3472. Vinnikov, K.Y., A. Robock, R. J. Stouffer, J.E. Walsh, C.L. Parkinson, D.J. Cavalieri, J.F.B. Mitchell, D. Garrett, V.F. Zakharov, 1999. Global warming and Northern Hemisphere sea ice extent. Science 286, 1934-1937. Weller, G. and P. Anderson (eds. ), 1998. Implications of Global Change in Alaska and the Bering Sea Region. Proceedings of a workshop, June 1997. Center for Global Change and Arctic System Science, University of Alaska Fairbanks, Fairbanks, Alaska. 157 p.
We can reduce global warming emissions and ensure communities have the resources they need to withstand the effects of climate change—but not without you. Your generous support helps develop science-based solutions for a healthy, safe, and sustainable future. 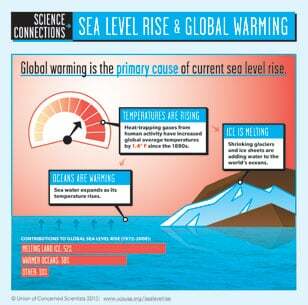 Sea level is rising—at an accelerating rate—especially along the U.S. East Coast and Gulf of Mexico. We have reached a tipping point on climate action—Scientists say we have roughly one decade left to avoid the most severe consequences of climate change. Urge your legislators to act on climate.